Rulmeca Corporation’s new Road Show trailer is currently out visiting customers, enabling our staff to explain Motorized Pulley technology from coast to coast. The picture above shows the new rig on a break while visiting underground mines and power plants in western Wyoming. We are visiting not only bulk handling facilities, but also meat, fruit, nut, and vegetable processing plants and engineering companies. If you would like us to visit your facility, click here for an appointment. The climate-controlled trailer enables conveyor operators, engineers, and maintenance personnel to see, first-hand, how Rulmeca Motorized Pulleys can solve technical conveyor drive problems such as reliability, safety, and maintainability. Inside the travelling “Road Trailer”, a variety of functioning Rulmeca Motorized Pulleys, as well as touch screen monitors, enable visitors to easily understand why hermetically-sealed and self-lubricating conveyor drives can solve a variety of problems. 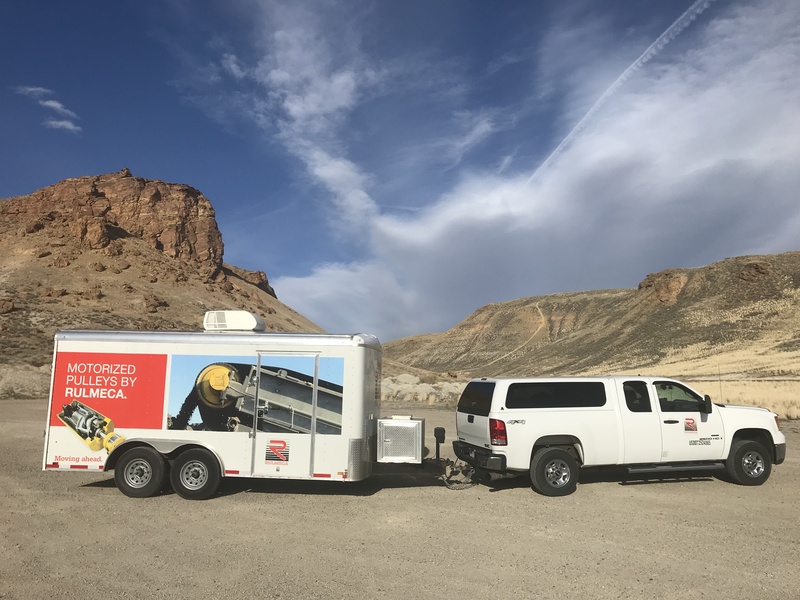 Road Show trailer number two will go anywhere, anytime, to explain Rulmeca Motorized pulley technology and help our staff find and solve conveyor drive problems. We retired our first Road Show trailer after she logged nearly 200,000 miles on her cross country journeys.